Art and garden historian Fell investigates the relationships, mostly with women, that marked the painter’s life, showing how they reflected his thwarted emotional development. 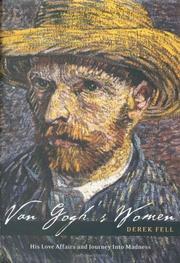 The structural blame can be laid at the feet of van Gogh’s mother, the author suggests. Conceived as a “replacement child” for an earlier stillborn son, Vincent was always the imperfect substitute in jeopardy of abandonment. He wore a shroud of anxiety and melancholy, “a diminished sense of self-worth,” as a result of never experiencing unconditional love from his mother—or father, for that matter. That lack, says Fell, found expression in a series of disastrous romantic relationships that were really pursuits of a mother substitute. Van Gogh’s chivalrous interest in damaged women prompted acts of self-mutilation to prove his love—acts that also had men as their objects: it was Gauguin’s rejection that sparked the infamous ear incident. But Fell (Van Gogh’s Gardens, not reviewed) steers a wary course, abstaining from any pronouncements regarding his subject’s sexual orientation. He feels more comfortable with bipolar mental illness as an explanation for van Gogh’s seizures and high eccentricity, with the withholding of early affection identified as the seedbed of his misery. In the midst of all the psycho-profiling, Fell also finds time to comment on the evolution of van Gogh’s art. He chronicles the move to Arles in search of the spontaneity, striking perspectives, and easeful clarity of Japanese linework; he examines van Gogh’s fraught yet cross-fertilizing sojourn with Gauguin at his home in the south of France. Then back to madness, rejection by Dr. Gachet, worries over his brother’s stipend, and the final, mortal act of mutilation. Readers’ hearts will go out to this tortured soul..